La Spezia owners Sean Yuquimpo and Aaron Shiu were restaurant hoppers first before they became restaurateurs, so they know what not to do when it comes to Italian food—particularly with burrata. “Burrata should have a firm skin on the outside but still creamy and curdy on the inside,” says Yuquimpo. Other restaurants, he says, serve this Italian mozzarella and cream cheese hybrid “all hard and pasteurized” that are just, frankly, plain mozzarella. 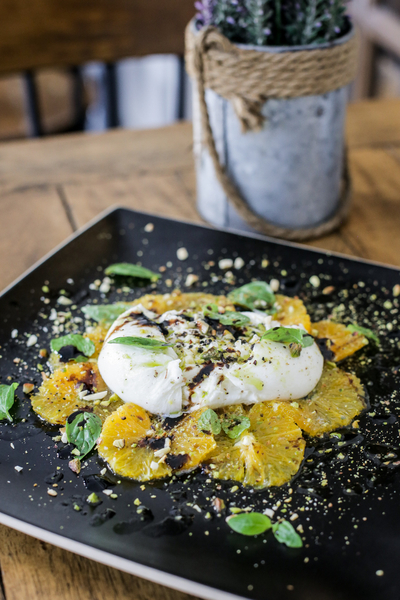 So he delivered us their own burrata, a dish as legitimate as it can be—fresh buffalo mozzarella imported from Italy surrounded by orange slices, basil, mint, and capped with drizzles of basil oil and a bit of reduced balsamic vinegar. Pistachio and almond bits add texture to this otherwise smooth fare. La Spezia’s menu changes every three months but burrata stays. They just change some components in the dish, replacing the oranges with other fruits in season from time to time. Deviating from the usual Italian concepts in the country, the two friends opened La Spezia to reintroduce pasta in a different light. Literally and metaphorically speaking. Unlike other restaurants in the Tomas Morato area illuminated by huge, flashy signs, La Spezia’s allure is in its understated, inconspicuous vibe. Its facade looks just like a house, with the engraved letters in concrete as proof of their existence. La Spezia is a coastal town in Italy, the prelude to UNESCO World Heritage Site Cinque Terre. “Beautiful things don’t need attention,” says Yuquimpo with an air of confidence and a chuckle. Food is still the most celebrated part of any Italian restaurant after all. And their new items are as engrossing and authentic as their attention to detail. You can have this Risotto Ai Funghi without the shaved Italian black alba truffles if you prefer. This Spaghetti Pomodoro E Basilico is stuffed with Italian sundried tomatoes finished with basil and 18-month Parmigiano-Reggiano shreddings. If you need your rice fix, have their peppery Risotto Ai Funghi. 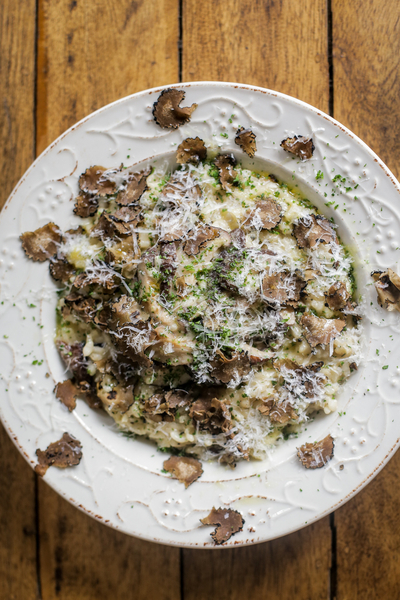 It’s arborio rice topped with shiitake mushrooms and parsley and sprinkled with 18-month Parmigiano-Reggiano, an aged parmesan that gives off a nutty and savory flavor. 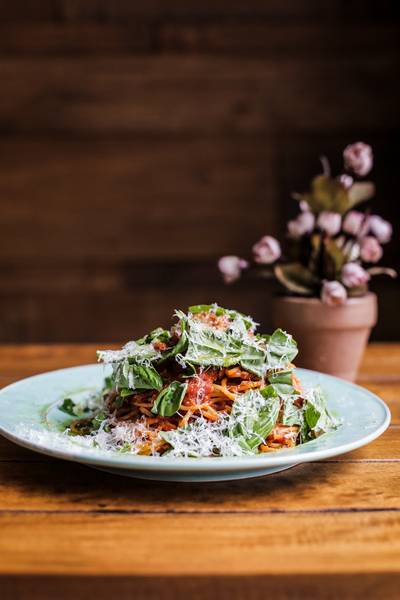 Yuquimpo’s own Spaghetti Pomodoro E Basilico recipe occupies its place in the menu because of the subtle depth of flavor. “We added pancetta (Italian bacon made of pork belly meat) skin, which is not evident on the surface, but actually adds up to the flavor,” he says. The pork belly’s skin is as crispy as it looks in this photo. Pancetta Di Maiale, Fagioli Bianchi is basically a sous vide pork belly with sweet potatoes, bok choy, and jus on the side. 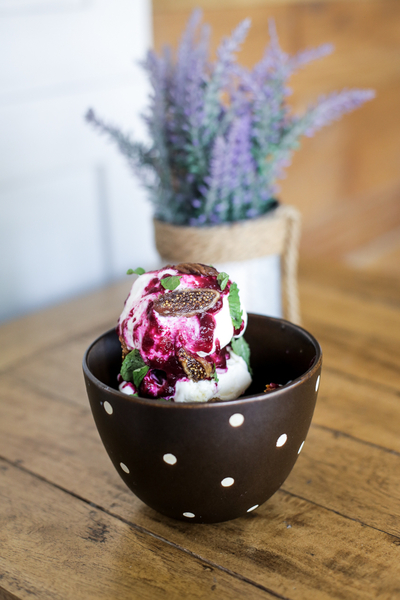 Then finish off with the striking La Spezia Alveare, a honeycomb-adorned gelato that gets its magenta sheen from the beetroot-ginger coulis—a blend of boiled beetroot for the color and ginger for a throat-cleansing effect to balance the sweetness. This towering dessert is already good for two. Also go for their Spaghetti Pomodoro E Basilico for a different take on pomodoro pasta. They add pancetta skin in the sauce for more depth of flavor.